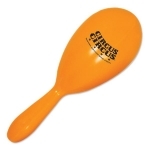 The custom maracas can bring you vast exposure than you imagine. These Latin American musical instruments can certainly make their party a memorable day in their life. 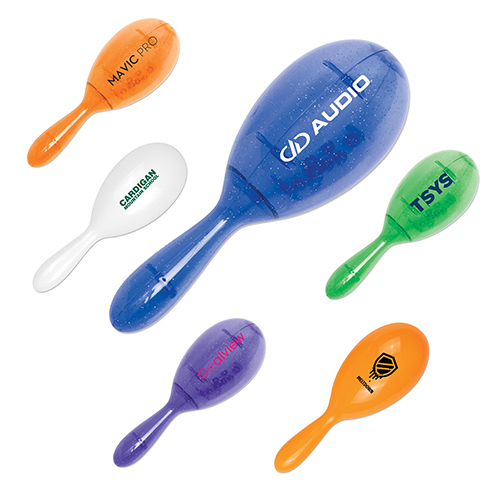 The brand imprint on these promotional maracas never goes unnoticed. 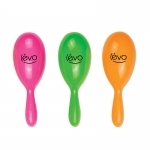 These 7 inch musical instrument will add to the entertainment factor. 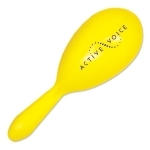 The personalized Maracas are CPSIA compliant and are safe for children. 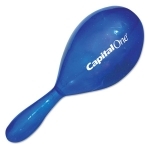 These are perfect fun toys to promote the brand name in any sporting event or musical programs. The logo will surely shine with the music. The toys are available in neon assortment. These are available as blank products too. Available Colors : Translucent Blue, Translucent Green,Translucent Purple,Translucent Orange,Orange,White, Assorted. Imprint Area : 2" X 1 1/4"
The produce was exactly what I wanted and looked exactly like the proof and photo on the website. They were a great quality for a great price. Big hit! I was really impressed with the quality of the product, quickness of production, and phenomenal customer service. I waited until last minute to order and really didn't think it would be possible to have these ready for my event, but the company was very responsive and worked with me to do everything they could for me. I ended up getting the maracas just in time for the event, and I am really thankful for the attention and professionalism that they showed me! Next year I won't wait until last minute to order!